Arminianism derives its name from James Arminius, a minister of the Reformed Church in Holland who lived from 1560 to 1609. He became Professor of Divinity in the University of Leyden, in 1603. It was particularly during the period of his professorial activity at Leyden that he gave expression to the departures from the Reformed Faith that have ever since been associated with his name. Arminius died in 1609, but he left behind him disciples who continued to teach and develop his tenets. In 1610 a document known as the "Remonstrance" and frequently spoken of as "The Five Arminian Articles" was signed by forty-six ministers and presented to the civil authorities of the United Provinces. These articles set forth the doctrine of the "Remonstrants" or Arminians, as they came to be called, on the subjects of predestination, the extent of the atonement, the cause of saving grace, and perseverance. These articles were both negative and positive - they denied one doctrine and affirmed another. In the early stages of the controversy the precise hearings and implications of some of the points had not become explicit, but, as the conflict precipitated by the Remonstrants developed, it became evident that the five points of the Reformed Faith which the Arminians were particularly insistent upon denying were unconditional predestination, limited atonement, total depravity, irresistible grace, and the perseverance of the saints. These Calvinists affirmed, Arminians denied. These five points do not define for us what the Reformed Faith or Calvinism is. The Reformed Faith is a system of truth and is much more comprehensive than any five points that might be enumerated, however important in it or essential to it these five points might be. In these five points attacked by the Arminians, however, the system of truth known as Calvinism may said to be crystallized. They express what this system is in opposition to the Arminian system or any other system that, in similar fashion, is opposed to it. They ever continue to be the decisive points at which conflict is joined with any system of thought that is moved by an Arminian bias and directed by the same underlying principles. Neither are we to think that the error of Arminianism is confined to these five points. Arminianism is a theology and the difference between this theology and the theology of the Reformed Church comes to expression at many other points. The error of the Arminian theology is, however, summed up in these five points and so the greater part of the controversy in the past is quite justifiably found to concern the doctrines enunciated in them. What is true in reality has been demonstrated by history. The first article of the Remonstrance of 1610 concerned predestination. All of the early Reformers were substantially at one on the doctrine of predestination. It is in the Reformed Church alone, however, that the doctrine of absolute predestination held by Luther as well as by Calvin continued to hold sway and came to its rights. What does it mean? "i. God from all eternity did, by the most wise and holy counsel of His own will, freely and unchangeably ordain whatsoever comes to pass: yet so, as thereby neither is God the author of sin, nor is violence offered to the will of the creatures, nor is the liberty or contingency of second causes taken away, but rather established. "iii. By the decree of God, for the manifestation of His glory, some men and angels are predestinated unto everlasting life, and others foreordained to everlasting death. "iv. These angels and men, thus predestinated and foreordained, are particularly and unchangeably designed; and their number is so certain and definite, that it cannot be either increased or diminished. "v. Those of mankind that are predestinated unto life, God, before the foundation of the word was laid, according to his eternal and immutable purpose, and the secret counsel and good pleasure of His will, hath chosen in Christ unto everlasting glory, out of his mere free grace and love, without any foresight of faith or good works, or perseverance in either of them, or anything in the creature, as conditions, or causes moving him thereunto; and all to the praise of his glorious grace." This statement of the doctrine was framed by the Westminster divines in 1645, but it is just the well-articulated creedal expression of the doctrine held by the early Reformers, conserved in the Reformed Church, and attacked by the Arminians. The import of the first section quoted is just this: that the whole sweep of universal history from the beginning to the end, in all its extent and minutest detail, is embraced in the plan and decree of God, that all that comes to pass, great or small, good or bad, God from eternity immutably determined would come to pass. It is not, however, in connection with the all-comprehensive decree of God that the conflict with the Arminian in the first instance is joined. It is as this decree comes to bear upon the destinies of rational beings and more particularly upon the destinies of men, in other words, as the decree becomes operative in the predestination to life of some of mankind and the foreordination to death of others. But the doctrine of the general decree bears directly upon the question of the destinies of men. If God freely and unchangeably ordains whatsoever comes to pass, and if it comes to pass that some men are saved and some perish, then surely He has freely and unchangeably ordained these facts as well as others. If the Arminian denies the latter he must also deny the former. Predestination to life and foreordination to death mean substantially that from all eternity God sovereignly, according to the counsel of His will, chose or elected a definite number of the human race to everlasting life, that He elected them as individuals, and that in making this election He was not conditioned by His foresight of faith or good works or perseverance in both, but that the election was determined by that sovereign good pleasure which finds its whole ground and explanation in Himself and in nothing else. In other words, God by an absolute, unconditional, and unchangeable decree determined the salvation of certain persons out of free grace and love, and that in accordance with that decree He executes the purpose of His grace and love. The others not elected, by the exercise of the same sovereign good pleasure He decreed to pass by and ordain to everlasting destruction as the reward of their sins. It is this doctrine Arminianism denies. In the words of James Arminius, "God has not absolutely predestinated any men to salvation; but that he has in his decree considered them as believers." It is peculiarly important that this fact should be appreciated. The fundamental principle of Arminianism on this article of faith is denial of the doctrine set forth in Reformed Standards. Too often the significance and seriousness of this is obscured by appeal on the part of Arminians to the positive side of their teaching. We must not allow this obscuration. Arminianism starts with negation, the denial of the doctrine of sovereign unconditional election. 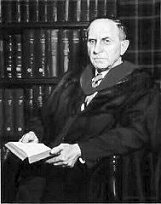 However much truth the more positive elaboration of the Arminian position may embody, it in no way ceases to be Arminian as long as the denial of unconditional election remains, for this is the crux of the question. Everyone who denies unconditional election denies an aspect of truth that is of the essence of Reformed doctrine. The Arminian position involves, as we have already hinted, more than negation. The Remonstrance reads thus: "Article I. That God, by an eternal unchangeable purpose in Jesus Christ His Son, before the foundation of the world, hath determined out of the fallen, sinful race of men, to save in Christ, for Christ's sake, those who, through the grace of the Holy Ghost, shall believe on this his Son Jesus, and shall persevere in this faith and obedience of faith, through his grace, even to the end." On superficial examination it might appear that there is no essential difference between this and the position set forth in the Reformed Standards. Does it not speak of an eternal and unchangeable purpose of God by which He determines to save all who believe on His Son and persevere to the end? It certainly does this, and no one in this controversy will deny that what is said is as such true. God does eternally and unchangeably determine to save all who believe and persevere in holiness to the end. But there is a chasm of difference between what the Arminian here affirms and what the Calvinist affirms. The difference is just this. The Calvinist affirms that God eternally and unchangeably decrees the salvation of certain persons whom He sovereignly distinguishes by this decree from those who are not appointed to salvation. In pursuance of this decree of salvation He decrees the ends towards its accomplishment, and so decrees to give faith and perseverance to all those predestinated to salvation. The Arminian denies any such decree bearing upon the salvation of individuals, and what he affirms in its place is that God decrees or purposes to save all who believe and persevere in faith and obedience to the end. In the former case there is the eternal destination to salvation of persons who are the objects of God's sovereign election; in the latter case there is the divine purpose to save the class characterized by faith and perseverance. In the ultimate analysis the former is the election of persons, the latter is the election of qualities with the provision that all who exhibit these qualities will be saved. Some Arminians under the stress of the argument, and also on exegetical grounds, perceive the inadequacy of the foregoing position, and so they say that God not only decrees to save all who believe, but that He also elects all who believe. There is therefore, they say, an eternal unchangeable election of individuals whose number is certain, an election indeed of all who are to be ultimately saved. Some may be disposed to say that this is exactly the teaching of the Reformed Standards. A little investigation will expose the fallacy of this. The hallmark of Calvinism is unconditional election and that is exactly what this highest type of Arminianism vigorously denies. It professes indeed fixed and unchangeable election of individuals. But what is meant is, that, since God decrees to save all who believe and since He knows perfectly beforehand and from eternity who will believe, He on the basis of that foresight as ground and cause elects these individuals to eternal life. God elects all whom He foresees will believe and persevere to the end. His election then is determined by His foresight of some difference that comes to exist among men, a difference which He Himself does not cause but which in the final analysis is due to sovereign choice on the part of the human will. The determining factor in this type of election then is not the sovereign unconditioned good pleasure of God but the decision of the human will which God from eternity foresees. Election is not the source of faith, but faith foreseen is made the source or condition of election. On close examination it should be evident that this is not divine election at all. The sovereign determination of God is ruled out at the vital point, for the ultimate determinant of the discrimination that exists among men is made to be something in men and not the sovereign good pleasure of God. Indeed this type of Arminianism that at first appears to approach so closely to the Reformed position only serves to show more clearly the total difference between the two systems. The election taught in the Reformed Church is election to salvation and eternal life and therefore also to faith and all other graces as the means ordained of God to the accomplishment of His sovereign decree. Election is not then conditioned upon faith, but faith is the fruit of election. God sovereignly works faith in men because He has in His eternal counsel appointed them to salvation. Faith is not the logical prius of election, but election is the eternal prius and source of faith. Arminianism at its best denies all of these propositions. The denial of unconditional election strikes at the heart of the doctrine of the grace of God. The grace of God is absolutely sovereign and every failure to recognize and appreciate the absolute sovereignty of God in His saving grace is an expression of the pride of the human heart. It rests upon the demand that God can deal differently with men in the matter of salvation only because they have made themselves to differ. In its ultimate elements it means that the determining factor in salvation is what man himself does, and that is just tantamount to saying that it is not God who determines the salvation of men, but men determine their own salvation; it is not God who saves but man saves himself. This is precisely the issue. "The Lord Jesus, by his perfect obedience and sacrifice of himself, which he through the eternal Spirit once offered up unto God, hath fully satisfied the justice of his Father; and purchased not only reconciliation, but an everlasting inheritance in the kingdom of heaven, for all those whom the Father hath given unto him." This definitely states that reconciliation and an everlasting inheritance in the kingdom of heaven is purchased for all those given to the Son by the Father. Who are they? In section 1 of this same chapter we are told that they are the people given to Christ from all eternity to be His seed and "to be by him in time redeemed, called, justified, sanctified, and glorified." The people given to Christ are surely the same as the people chosen in Christ - the form of expression used in chapter III, section v - and they are simply those of mankind predestinated unto life, namely, the elect. With respect to them the Confession continues: "As God hath appointed the elect unto glory, so hath he, by the eternal and most free purpose of his will, foreordained all the means thereunto. Wherefore they who are elected being fallen in Adam, are redeemed by Christ; are effectually called unto faith in Christ by his Spirit working in due season; are justified, adopted, sanctified, and kept by his power through faith unto salvation." (III.vi.) It is for the elect, therefore, for the predestinated to life, for those given to Christ by the Father, for those chosen in Christ unto everlasting glory, that reconciliation and an eternal inheritance in the kingdom of heaven is purchased. It is they who are redeemed by Christ. Thus teaches the Confession, and so the difference has already become apparent. So explicit is the above statement that it needs no confirmation. But in order to show that this is not a random statement but a determining principle of the Confessional teaching it can be shown by an entirely distinct line of argument. "Christ by his obedience and death did fully discharge the debt of all those that are thus justified, and did make a proper, real, and full satisfaction to his Father's justice in their behalf." (XI.iii.) Those for whom Christ discharged the debt and made satisfaction to justice are then the justified. But all who are justified are also effectually called. "Those whom God effectually calleth, he also freely justifieth." (XI.i.) And effectual calling expounded in chapter X refers us back to predestination. "All those whom God hath predestinated unto life, and those only, he is pleased, in his appointed and accepted time, effectually to call, by his word and Spirit, out of that state of sin and death in which they are by nature, to grace and salvation by Jesus Christ." (X.i.) And again: "God did from all eternity decree to justify all the elect; and Christ did, in the fullness of time, die for their sins, and rise again for their justification." (XI.iv.) The upshot is plain - predestination to life, redemption, effectually calling, and justification have identical extent; they have in their embrace exactly the same persons. Let it not be thought that the Arminian by his doctrine escapes limited atonement. The truth is that he professes a despicable doctrine of limited atonement. He professes an atonement that is tragically limited in its efficacy and power, an atonement that does not secure the salvation of any. He indeed eliminates from the atonement that which makes it supremely precious to the Christian heart. In B. B. Warfield's words, "the substance of the atonement is evaporated, that it may be given a universal reference." (The Plan of Salvation, p. 122.) What we mean is, that unless we resort to the position of universal restoration for all mankind - a position against which the witness of Scripture is decisive - an interpretation of the atonement in universal terms must nullify its properly substitutive and redemptive character. We must take our choice between a limited extent and a limited efficacy, or rather between a limited atonement and an atonement without efficacy. It either infallibly saves the elect or it actually saves none. Arminians do in general terms assert the depravity of fallen human nature. But a merely general statement of the fact does not touch the heart of the question. The real question is the seriousness with which the general statement of the fact is taken and the willingness there is to appreciate all the implications of it. In a word, it is the question of the totality or entirety of this corruption. Our Confession of Faith says with respect to our first parents and their sin in eating the forbidden fruit: "By this sin they fell from their original righteousness, and communion with God, and so became dead in sin, and wholly defiled in all the faculties and parts of soul and body. "They being the root of all mankind, the guilt of this sin was imputed, and the same death in sin and corrupted nature conveyed, to all their posterity, descending from them by ordinary generation. These are highly compressed and succinct statements of total depravity, and their meaning and consequences ought to be carefully weighed. They are peculiarly offensive to every view that hangs on to any vestige of optimism with respect to the qualities or potencies inherent in human nature as fallen. Indeed they must arouse the opposition and emphatic protest of every view that suspends any hope on the autonomy of the human will. It is just because the Arminian does in the last analysis place the determining factor in the individual's salvation in the free choice of the human will, that he has taken such unrelenting issue with the doctrine of the Reformed Churches. The Confession does not, of course, deny to men what we may call natural virtue or civil righteousness. It affirms that works done by unregenerate men may, as regards the matter of them, be things which God commands, and of good use both to themselves and others. Neither does it say that all men are equally depraved, or to put it more accurately it does not say that this corruption "whereby we are utterly indisposed, disabled, and made opposite to all good, and wholly inclined to all evil" receives the same degree of development and expression in all. What the Confession does is to set forth the teaching of Scripture with respect to the moral and spiritual condition of men as they stand in the pure light of the divine standard and judgment. Judged by that norm they are dead in sin and wholly defiled. As is apparent from the foregoing discussion it is in connection with the operations of God in His saving grace that the implications of the affirmation or denial of the doctrine of total depravity come to light. The question here is: What is the mode of the divine operation of the Spirit of God in bringing men to faith and repentance? All are agreed that men are saved through faith. But the difference arises when we come to explain the fact that, of those who indiscriminately receive the overtures of grace in the gospel, some believe and some do not. The question is not in general terms that of grace. Arminians concede that men cannot be saved apart from the gracious operations of the Spirit of God in the heart. The question is: What is the nature of that grace? What is the cause of faith? Why is it that some believe to the saving of their souls and some do not? Is that grace of God given to all indiscriminately, or is it a grace given only to those who believe? Is it a grace that may be resisted, or is it always efficacious to the end in view, and therefore incapable of being frustrated? Arminians though exhibiting certain differences among themselves are agreed that sufficient grace, whether it be regarded as a natural possession or a gracious bestowal, resides in all, and therefore that all men have the ability to believe. The explanation of the fact that some believe and some do not rests wholly in a difference of response on the part of men. This difference of response may be stated in terms of co-operation with, or improvement of, the grace of God. But in any case the explanation of the difference lies exclusively in the free will of man. For the difference of response on the part of the believer as over against the unbeliever he is not only wholly responsible but he, in the exercise of the autonomy that belongs to his will, is the sole determining factor. God does not make men to differ. He operates no more savingly and efficaciously in the man who believes than He does in the man who does not believe. For this indiscriminateness in the saving operations of God, the Arminian is exceedingly jealous; he demands that what God does for and in one He does for and in all equally. In the ultimate, then, the issue of salvation rests with the sovereign determination of the human will. Men make themselves to differ. Now it is easy to see that , if man is thus able to co-operate with or improve the grace that is common to all, there must remain in man some vestige of good. Indeed, so decisive an element of ability to good survives that it determines the exercise of the most important event or series of events in the history of the individual. And this is exactly where the Arminian position impinges not only upon the sovereignty and efficacy of God's saving grace but upon the total depravity of sinful man. In magnificent contrast with this denial of the sovereignty and efficacy of the saving grace of God is the teaching of our Confession. It reads: "All those whom God hath predestinated unto life, and those only, he is pleased, in his appointed and accepted time, effectually to call, by his word and Spirit, out of that state of sin and death in which they are by nature, to grace and salvation by Jesus Christ; enlightening their minds spiritually and savingly to understand the things of God; taking away their heart of stone, and giving unto them an heart of flesh; renewing their wills, and by his almighty power determining them to that which is good; and effectually drawing them to Jesus Christ; yet so as they come most freely, being made willing by his grace. In these sections the faith that embraces Jesus Christ to the saving of the soul is referred to the sovereign predestination of God as its source, and to the regenerative operation of God in the heart as its cause. God is sovereignly pleased to impart His efficacious grace, and it is the enablement that comes from this sovereign bestowal of the grace of the Holy Spirit that leads to faith. The person effectually called is altogether passive therein until renewed by the Holy Spirit. A new heart has been given him and a right spirit created within him by the mysterious work of the Holy Spirit; and because he has a new heart and a right spirit his response to the call of the gospel cannot but be one of loving reception and trust. Just as the reaction of the carnal mind cannot but be one of enmity against God, so the reaction of the mind of the Spirit cannot but be one of faith and trust. It is the very nature of the new heart to trust God as He is revealed in the face of Jesus Christ. We have here in our Confession a rather neat statement of the relation of faith to regeneration. In this realm of theological debate our position can very readily be tested by our answer to the questions: Does God regenerate us because we believe, or do we believe because God has regenerated us? In other words what has the causal priority, regeneration or faith? There are many evangelicals who will say that faith is the means of regeneration, that God regenerates those who believe and because they believe. They thereby, whether wittingly or unwittingly, place themselves in the Arminian camp and in the most decided opposition to Reformed doctrine. Logically they place themselves - perhaps with good intentions - in a position that leads to the wreck and ruin of true evangelicalism. We are, of course, using the term "regeneration" in the restricted sense of the new birth, and in this sense the very hallmark of Calvinism as of Augustinianism is that faith is the gift of God, because it proceeds from the regenerative operation of the Holy Spirit as its only cause and explanation. God has elected His people to salvation. He has ordained that this salvation become theirs through faith. But because of the total depravity of their hearts and minds they cannot exercise faith; they are dead in trespasses and sins. In order to bring them to faith God implants by the agency of the Holy Spirit a new heart and a right spirit within them, and thus effectually and irresistibly draws them to Christ. They are made willing in the day of God's power. By grace they have been saved through faith, and that not of themselves, it is the gift of God. In the closest relation to the foregoing doctrine of efficacious or irresistible grace is the doctrine of the eternal security of the believer. This doctrine the Arminian bluntly rejects. A true believer, he says, may be in grace and then fall from grace and finally perish. Such a position is in logical coherence with his doctrine of the nature of saving grace. If the determining factor in the matter of an individual's salvation is the autonomy of his own free will, then consistency would seem to be all in favor of regarding salvation as a very insecure and mutable possession. Salvation in this case cannot be any more stable than that which in the final analysis determines it. But it is just here that the harmony of efficacious grace with the perseverance of the saints comes to light. The Reformed Faith recognizes that God it is who determines a sinner's salvation, and that what He begins He brings to perfection. Salvation rests upon the unchangeable grace of God. He will not forsake the work of His hands, nor make void His covenant. Thus reads the Confession: "They whom God hath accepted in his Beloved, effectually called and sanctified by His Spirit, can neither totally nor finally fall away from the state of grace; but shall certainly persevere therein to the end, and be eternally saved. This articles is from a series which first appeared in The Presbyterian Guardian in 1935-1936.